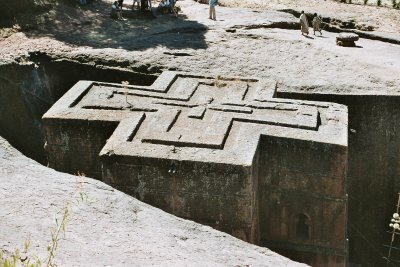 The rock-hewn churches of Lalibela are exceptionally fine examples of a long-established Ethiopian building tradition. After the decline of the Axumite state, a new Christian dynasty emerged in the 12th century. This Zagwe dynasty made its capital in Roha, some hundreds of kilometres south of Axum. According to a legendary account, King Lalibela was born in Roha. His name means 'the bee recognises its sovereignty'. God ordered him to build 10 monolithic churches, and gave him detailed instructions as to their construction and even their colours. When his brother Harbay abdicated, time had come for Lalibela to fulfil this command. Construction work began and is said to have been carried out with remarkable speed, which is scarcely surprising, for, according to legend, angels joined the labourers by day and in the night did double the amount of work which the men had done during the hours of daylight. Lalibela is a small and quite poor mountain town. It is also the most prominent pilgrimage spot in Ethiopia, and it houses one of the most amazing manmade constructions in the world. With a knowledgeable guide I visited the 11 rock-hewn churches. Only when you go down the size and the outside carvings of the churches become clear. The fact that the places are still religiously important, also adds a lot of atmosphere: pilgrims, priests and other clergy are abundant. I visited in september 2008. I found the people extremely humble and helpful. I was not hassled hardly at all. the Children are enthusiastic in this area but that is all. the churches are fantastic and some should be considered an eighth wonder of the world, especially St Georges church, which is designed in memory of Noahs Arc (now of course discovered on Mount Ararat as described in the Abrahamic faiths). There are many souveneres to buy without being presurised by the local shopkeepers. Food and accomodation here is also good quality. There has been recent development in for tourism here which I found to be very reasonable for qulaity and price for even western standards. In addition the local guards keep a firm control over anyone misbehaiving with respect to the locals. It seemed frowned upon by the guards when the youth were following us asking questions in very good english but they are totally harmless and quite well educated, a definate must see! The only thing negative is the harsh landing at Lalibella airport which you can expect as the planes are very small as is the airport. In one of the churches room King Lalibella remains are in one of the rooms. However only men are allowed in this room, so if any of the visiting gentlemen would like some peace and quiet for a while, that is the place! Though i am an Ethiopian i didnot visit and worship in any one of the amazingly constructed 11 rock hewn churches of lalibela. But this day came and i happened to be one of the luckily ones to get to know this amazing and spiritual site. Wow, don't ask me about the relief i got after looking at what king Lalibela (his holliness) and the people living at that period have gone through to build this unimaginable church. I get there through Ethiopian Airlines (the 2006 African Airline of the year)internal flights to lalibela, one of the oldest and spiritual centers of Ethiopia. 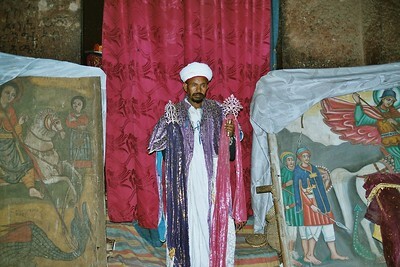 Lalibela's former name was Roha then changed to its present name only for the glory of the saint king. After i arrived at lalibela, i, unlike other foreign tourists, need not any guides since i know the lnaguage and i am an Ethiopian . every body was cooperative the pirests, the boys, every body and ofcourse i am very greatful to them. Ofcourse the road is a little bit difficult to go on but not that much. Ater i went inside into bete giorgis, meaning the house of saint George,( one of the rock hewn churches) i feel proud of my ancesstors ;you know the traditional paintings of different saints, the very old church worship instruments, the traditional ceremonies, and ofcourse the traditional pepople and priests themselves gives my soul an unforgettable pleasure. And i now am looking forward for my second journey. It was a fascinating day when my family and I arrived in Lalibela and drove in from the new airport (which was a bit of a drive, but well worth it). The churches were magnificent. We had a guide that took us through all of the churches in two days. We had an opportunity to go on a 3-4 hour mule ride (scary at times, but well worth it). The monastery/church on the mountain is off the beaten track and there were times where we had to dismount in order to continue forward. The mule drivers supplied us with their walking sticks, so there were no problems. Great view, great church, and a good time. I slipped and fell right outside the church of Bet Giorgis. I recommend never wearing flip-flops when visiting, I needed the traction from a boot or a tennis shoe. Paul was right. There were quite a few people that wanted to follow us around and "practice their English" with us. The guide we had when we went spoke great English and told us many things about the churches. If you are going to be in Ethiopia, you've got to stop by Lalibella, or as the guide called it, "New Jerusalem". Lalibela is wonderfully “Ethiopian” – you really do feel that you are seeing something which is different from anything you would see elsewhere. 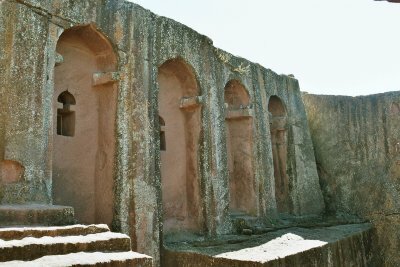 There are other “rock cut” religious structures around the world but Lalibela possesses an atmosphere of “otherness”. Even if you don’t visit at the time of a religious festival (we didn’t unfortunately) you will see/meet Ethiopian Priests in the churches and get some feeling for the rituals – which mostly take place in inner sanctums containing the “Ark” and are inaccessible to ordinary mortals, with only the sounds to hint at the activities going on behind the curtains. As a European visitor you will have to accept the high “hassle factor” – you are very much an “opportunity”! As we emerged from our hotel we were accosted by a boy wanting to act as our guide. We usually decline and initially did so on this occasion. Not worth it. Even if he doesn’t/can’t do much guiding his mere presence will save having to continually dissuade alternative contenders. We gave in for this reason - it also appeared that we were his “assigned” tourists for the day to meet as we emerged, follow us wherever we went and use all his powers of persuasion on – if he failed he would go to the back of the guide queue and await his next turn “unpaid” for that day. As most tourists do we flew in and out on the generally good and very cheap Ethiopian Airways internal flights. I understand that Lalibela “airport” has been resited/acquired a new runway since we were there in 1995. This should make this wonderful place a little less fraught to visit. Any rain closed the old airstrip. And getting away could be a bit of a lottery too. At that time the only communication the local Ethiopian Airlines had with flight control in Addis was via an unreliable radio connection at the “7 Olives Hotel” which, because of geographic/climatic conditions, only seemed to work at night. Thus the morrow’s possible flights were agreed the previous evening and, in the morning, one traversed the several miles of rough road on a 4x4 to the tin hut which was the airport terminal to be weighed with one’s bags on a set of old luggage scales and await whatever plane(s) might turn up! We finished up doing an aerial tour of the country to reach our next destination at Gondar.